Sir Paul McCartney is a key figure in contemporary culture as a singer, composer, poet, writer, artist, humanitarian, entrepreneur, and holder of more than 3 thousand copyrights. He is in the "Guinness Book of World Records" for most records sold, most #1s (shared), most covered song, "Yesterday," largest paid audience for a solo concert (350,000+ people, in 1989, in Brazil). He is considered one of the most successful entertainers of all time. The Beatles disbanded in 1970, breaking fans' hearts worldwide. However, McCartney had no intention of dropping out of the public eye. 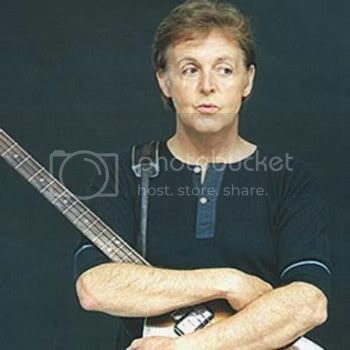 He was the first of the Beatles to release a solo album (McCartney, 1970), and though critics' reactions were mixed, the album was a hit with the public. Encouraged, McCartney went on to form Wings, a band that would remain popular throughout the '70s, winning two Grammy Awards and churning out multiple hit singles. In 1969, McCartney married Linda Eastman, an American photographer who would serve as her husband's muse for the next 30 years. The family had four children: Heather (Linda's daughter from a previous marriage), Mary, Stella and James. The 1980s proved a trying time for McCartney. An arrest for marijuana possession in Japan in 1980 was followed shortly by the devastating assassination of his longtime partner and friend, John Lennon. In the wake of Lennon's death, McCartney stopped touring until 1989. He continued to play and record new music, however, collaborating with the likes of Stevie Wonder and Michael Jackson. In the '90s, McCartney worked with former bandmates Harrison and Starr on The Beatles Anthology documentary series. In 2012, McCartney released Kisses on the Bottom, which featured renditions of some of his favorite songs from childhood, including classics like "It's Only a Paper Moon" and "My Valentine." McCartney made headlines later that year, after performing with fellow rocker Bruce Springsteen at London's Hyde Park. The two legendary rock musicians even performed two Beatles hits together: "I Saw Her Standing There" and "Twist and Shout." Unfortunately, this impressive live jam was cut short by the authorities: When the concert exceeded its scheduled end time, both Springsteen's and McCartney's microphones were turned off by event organizers. More recently, McCartney signed on to headline the 2013 Bonnaroo Music & Arts Festival, a four-day event held annually in Manchester, Tennessee. Other performers named to the event's lineup include Tom Petty, Billy Idol, John Oates of Hall & Oates, Jeff Tweedy and Björk. McCartney is inarguably pop music royalty. For his contributions to global rock 'n' roll culture, he has been knighted, named a fellow at the Royal College of Music, and inducted into the Rock and Roll Hall of Fame, among various other honors. This is a tribute to the memory of Maureen Starkey.